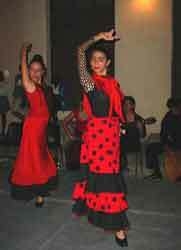 The Group Sangre Gitana, one of the most attractive socio-cultural projects of Joaquín de Agüero House of Culture in Camagüey, is a faithful exponent of the Spanish cante jondo and flamenco. Sangre Gitana (Gypsy Blood) is made of 130 girls and teens who study in elementary and high Schools in town, and is conducted by young art instructor Yaineris Torres Pérez, who also founded the group with the lovely passion for this kind of cultural expression. “The original idea – she reminds – came out because of the need to go after the purest Spanish roots in the city of Camagüey, one of the first Villas founded by Don Diego Velázquez, almost 500 years ago. Personally speaking, I feel a great passion for the flamenco, so once I graduated and with the support of the House of Culture, I began to organize the group. alternating with Sangre Gitana at the Teatro Principal. the Ballet of Camagüey, the Artistic Ensemble Maraguán, of the local University – made up by amateur dancers and musicians -and Camagüey’s Folkloric Ballet. However, none artistic project intends to cultivate exclusively the flamenco here, so Yaineris decided to bet on the Spanish heritage in Camaguey... and she was successful. “The initial months were difficult, fundamentally the part of scouting girls in the schools, girls with certain aptitudes for the dance. However, step by step the project was taking shape and Sangre Gitana came true” Yaineris remembers. cultural institutions, in Work place etc. “We organize workshops to explain the characteristics of this genre. It is a very beautiful and necessary task”, upholds the young instructor. Yaineris is a dreamer, as she describes herself. Her pupils always praise her for the duty she assumes everyday in the rehearsals, and where the discipline rules in a bunch of girls whose ages rage between 5 and 16 years old. Meanwhile, girl Adienay Jiménez Molina –eight years of age - admires the instructor (Yaineris) for her patience and for those choreographies where she has the opportunity to become a great flamenco bailaora, just like she dreams. “When I was a very small baby – she tells me- I saw on the television a program on Spanish dance, and I told to my mom that I wanted to make the same thing. Now I am very happy thanks to Sangre Gitana . Certainly, Sangre Gitana has known how to walk solid and well through the path of the success that crowns the works undertaken with humility, but passion. All its members have their own reasons, the direction of the House of Culture Joaquín Aguero where it belongs, the Office of the Historian of the City of Camagüey, and the public to which Sangre … dedicate its art. Homage deserved to the ancestors arrived to this part of the Cuban geography, coming from Andalusia.